Today I was joined by my old racing buddy Lesley Ingram for the epic ride that is the Ciaran Path. This ride is a labour of love. 7hours on the hill and 4 hours ride time gives you an idea of what the terrain is like. I was so grateful to have an ever cheerful and competent rider to accompany me on this route that really takes you into the heart of the highlands. This morning on day 3 of thebestjobintheworld I was up at 7am filming the trails around the Glencoe Lochan before riding out with Lesley from Kinlochleven at 10am. Retracing my tyre prints from the Tour De Ben at the weekend, we got to the end of Loch Eilde Mor and this time swung right along the marginal single track by the river which flows to Loch Treig. 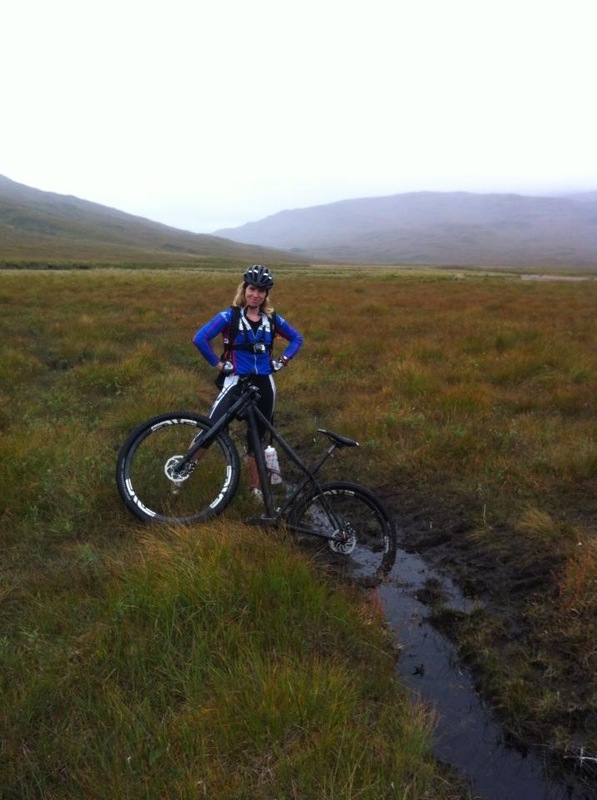 What the trail lacked in flow was made up for in entertainment as we leapt over bog, making it only 50% of the time. The trail remained marginal for 4km all the way to Loch Treig but very suddenly the river we had been following gave way to a breathtaking view over the loch. It was now that the carefully charged Go Pros failed again making me say a sweary word. 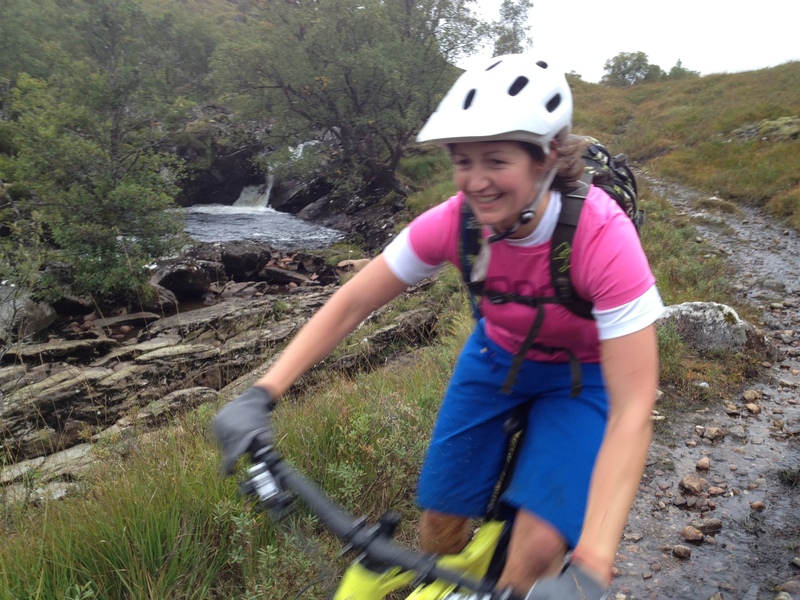 We rode round on well surfaced trail to the head of the loch where we turned north again on singletrack back towards kinlochleven and started the carry once more. It remained truly spectacular and felt so wild that we continued to be bouyed along despite the boggy conditions underfoot until gradually our trail became more and more rideable. Nearly 6 hours after setting off that morning we came into view of the dam and, despite wanting to descend on the famous singletrack to the village below we put our sensible hats on and followed the recommended route which had us crossing the dam to drop down on gravel road. When i say recommended I don’t mean necessarily allowed. We’ll have to go back and ride that singletrack for the guidebook. Can’t have people climbing over gates. Naughty. But worth saving for another day with a working Go Pro. We made it down in time for coffee and cake at The Ice Factor (highly recommended) and we parted ways. A little glassy eyed from our wilderness epic but delighted to have survived. Type 2 fun made Type 1 by great company. I remember Loch Treig, used to go up and down it, dragging stags off the hill, across the railway, down into the boat and then back up to the top and load them into the argo and back over to Loch Ossian and Corrour. Was a while ago….